All the links in this sub-directory are for text-only on white, non-graphic pages to make it easy for printing. The links to pages in other directories are npt graphic free. Before we begin it might be helpful to look at a very general overview: For those who prefer to bypass these few paragraphs, Click HERE. The Raccolta is traditionally thought of as the forerunner of the current Enchiridion of Indulgences, which it is, but actually it is more than that, for the former Enchiridion or Raccolta is a small compendium of the faith. You will need to see our Indulgence section for the applicable remission of temporal punishment due to sin as the older remission no longer applies. But the prayers are still efficacious in themselves and many of them still carry indulgences in the new regulations because the present Enchiridion makes allowances for a number of favorite formulas that may not be worded exactly as in the current edition, and thus, it grants a general indulgence for certain categories, such as Consecration prayers, etc. Any prayer from the Raccolta can be offered for the relief of a Holy Soul in Purgatory, apart from a partial of plenary condition, because all prayer on behalf of the Holy Souls, provided it is said devoutly by a soul in the state of grace, is considered of benefit as the Holy Souls cannot pray for themselves and are entirely dependent on our charity. They return our favors with prayers of their own on our behalf, as they may pray for us. An indulgence (L. indulgere, to be kind to) is the remission of temporal punishment due to sin, not the remission or pardon of the sin itself. The sin must already be repented of and forgiven by God. To gain an indulgence one must be in the state of grace, have the intention of actually gaining the indulgence and then perform the works and or prayers associated and required for that indulgence. No one may gain an indulgence for another person who is living, except for oneself, but most indulgences can be applied to a deceased person. "I will give you the keys to the kingdom of Heaven. Whatever you bind on earth shall be bound in Heaven; and whatever you loose on earth shall be loosed in Heaven." "Amen, I say to you, whatever you bind on earth shall be bound in Heaven, and whatever you loose on earth shall be loosed in Heaven." The teaching Magisterium of the Church in ecumenical councils also affirms indulgences. Christ gave the power of granting indulgences to the Church, and since the Church has, even in ancient times, made use of this divinely given power [Mt. 16:19; 18:18], the holy council teaches and commands that the usage of indulgences ----- a usage most beneficial to Christians and approved by the authority of the holy councils ----- should be kept up in the Church; and it anathematizes those who say that indulgences are useless, or that the Church does not have the power of granting them. Indulgences are drawn from the treasury of the Church, particularly from the infinite merits gained by Jesus Christ. You are also encouraged to visit Catholic Classics for the Devotion to the Holy Souls [link below], who cannot pray for themselves but rely utterly on our charity towards them. However, the Church is splendidly organized as the "Communion of Saints," the Church Triumphant, or Saints in Heaven, whom both the Souls in Purgatory, the Church Suffering, and we on earth, the Church Militant, can pray to; we in turn can pray for the Holy Souls who cannot pray for themselves; Heaven can pray for both of us; but the Holy Souls, can pray for their benefactors on earth. Please learn all you can about this most charitable and most necessary devotion. Many souls are completely forgotten by us on earth. Someday, if we are so fortunate as to make it that far and are spared eternal damnation, perhaps we will find ourselves in the same condition. Please adopt an unknown soul and pray for that soul every day. 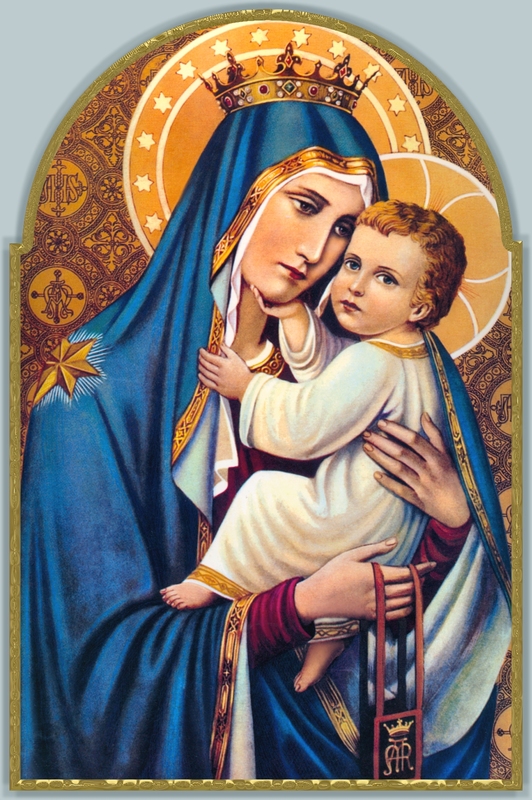 Ask Our Blessed Lady and Her Son to give you a soul who shall remain nameless to adopt spiritually. And please, adopt an unknown dying sinner every day, someone who is about to go to Hell and ask Our Lord to help that soul have a moment of final repentance due in part to your daily sacrifice and or prayers for that person. While we cannot gain a remittance of Purgatorian punishment for that soul we can at least pray for the repentance and salvation of that person we adopt. Perhaps on your deathbed as you face the judgment seat, those unknown souls will intercede on your behalf. As stated, one must be in the state of grace to pray efficaciously for a Holy Soul, while any one in the state of mortal sin can and must pray for themselves to repent. God hears all earnest prayers, but the Church has held that the state of grace is a requirement to pray for these special Souls. A dead soul is not pleasing to God and if a person dies in the state of mortal sin, he descends immediately to Hell. How can a dead soul pray for a soul that is not dead but merely being purified? If, for no other reason, even if you cannot love God as much and purely as you ought, this should motivate you to remain in the state of grace, so you can help relieve the agony of your deceased relatives and friends. An added word: Please remember to pray for the most forgotten souls and for the souls of religious and priests. Many Catholics think that priests and religious nuns and brothers are holier than they are and do not consider it necessary to pray for these souls. Thus, souls are in Purgatory without anyone to remember them. They are also other people who died alone or without anyone to remember them in prayer and they, too, are forgotten. Our Lady of Fatima told the three children that a young girl in their village, who had died, would in Purgatory until "the end of the world." Try to remember her soul especially. Thank you for visiting this directory and God bless you. FOR DEVOTIONS FOR AND TO THE HOLY SOULS, SEE HERE. FOR FULL EXPLANATION OF THE BROWN SCAPULAR, SEE HERE.